The Fraser homestead has barely been lived in and it's already time to build an addition to accommodate guests! It sure looks cozy with the fireplace lit and the dinner table set, but if Outlander Season 4 Episode 6 proved anything about Fraser's Ridge, it's that the long-wed couple needs to expand. Not only are they sharing their home with Ian, but Murtagh was visiting, and Lord John popped 'round with William in tow for an unexpected and welcome surprise. I'm not going to lie. Lord John has always been a favorite of mine. When he first met Jamie in battle and then when he took over the prison at Ardsmuir, he's had goodness in his heart. Sure, his feelings for Jamie probably swayed his decisions, but does it matter why someone chooses light over dark if they take the right path? I don't think so. Everyone finds the light for different reasons, and if Jamie was somewhat responsible for John being a better person in the long run, that's a win. Of course, I could be giving more credit than necessary to the feelings John has for Jamie being the catalyst for John's good heart, but as close as John is to the power that corrupts absolutely, you never know. After all, Counterpart airs right after Outlander and it's a study in what the smallest differences in a life can mean to the individual. If you don't watch, you should give it a go. I review that, too. It's also very thought-provoking and brilliant. We were treated to a Jamie-centric hour from all aspects, and for the first time, I realized what a terrible hand Jamie got in life. Lord John: Do you feel yourself content? 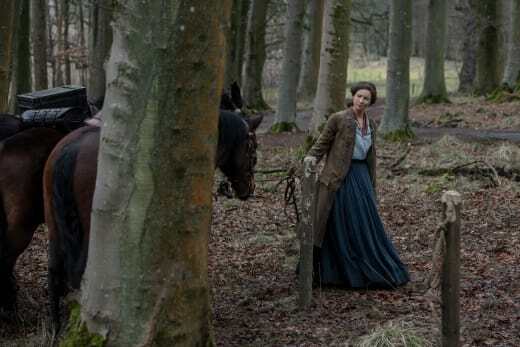 Jamie: I have all that a man could want -- home, honorable work, a wife by my side, good friends, and the knowledge that my son is safe and well cared for. I want no more. In the comments section of past reviews, I've been called a Jamie fan or a Jamie apologist or something like that. To be honest, I've never stopped to consider whether I had a side with the Jamie and Claire union. To be perfectly frank, with the series, I turned out to be a Frank fan. 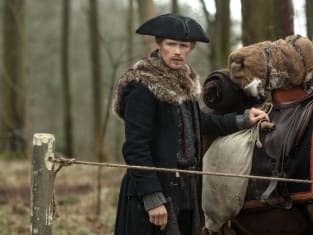 That was utterly unexpected given his status in the novels, but with the portrayal by Tobias Menzies and the added context for Frank on screen, he sprang to life in a way that stole my heart. But as of "Blood of My Blood," I see how lucky Frank was to have raised Brianna by Claire's side. Frank never got the love of Claire, who he loved very much, but he did have the love of a child, even one who was not the blood of his blood. Jamie and Frank are as intertwined in this story as John and Claire seemed to be after they had their feverish and further discussions about Jamie and his love and children. Jamie never complains about not having children that he got to love, inspire, teach, and impart upon his image of self. 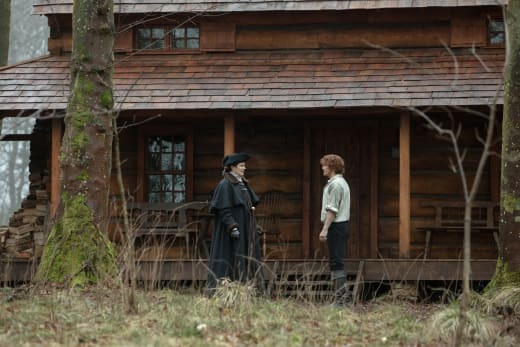 Claire wondered why John would take the risk of William recognizing himself in Jamie by visiting. William doesn't see himself in Jamie because his sense of self comes from John and Imogen, just as Brianna's sense of self came from Frank and Claire. Looks don't have much to do with it. For all of his goodness and his willingness to do the right thing no matter the cause, Jamie never got to raise his children. He had to entrust they were raised well by others. He had love in his life from Claire, but even that was taken from him for 20 years. Yet Jamie is content. He's content while the man who his son calls Papa sits before him. How can you be anything but a fan of Jamie Fraser? 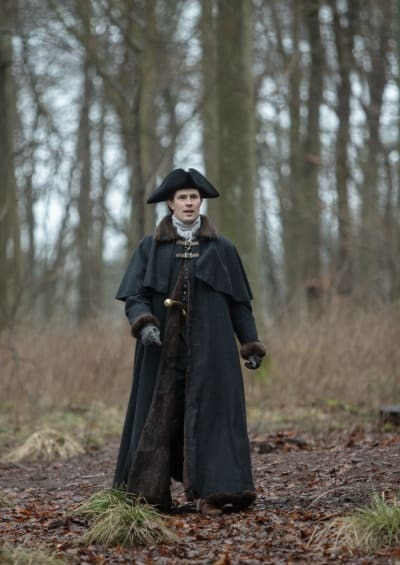 So when Claire questioned John's motives for visiting, I was a little offended on Jamie's behalf. Why would she assume John, who is raising Jamie's son, would visit on behalf of the Governor to spy on Jamie? She holds her husband in higher esteem than that. Murtagh's opinion of the event was acceptable and understandable. He is in the thick of the disagreement of the regulators and the Governor over the tax situation and had no idea Jamie had a son. Murtagh: By all accounts, it's the Governor himself who is unreasonable and dangerous. Lord John: Those regulators tied a Sheriff to his horse and marched with his beaten body through the streets of Hillsboro. There were women and children present. Would you call that reasonable? Lord John: I'm told there were many witnesses. Permalink: I'm told there were many witnesses. 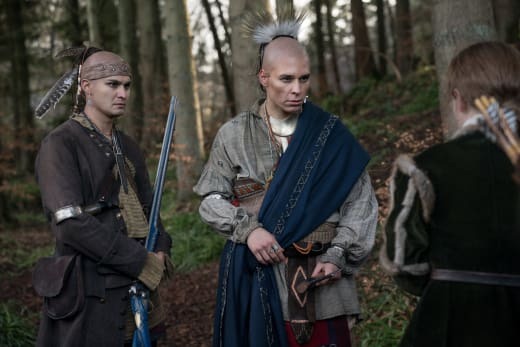 Taking that discussion to the dinner table was a little 2018 for my taste, but it seems every episode of Outlander Season 4 must have at least one reference to the current political atmosphere. By my count, there were at least two. As with any such discussion at mealtime, unless either party was there to witness the suggested mayhem, it's moot. And it's also about as appropriate in front of William as the dragging itself. To Murtagh, though, Lord John wasn't a close friend, and William was of no importance. When you find the time, perhaps you can tell me about his mother unless that's a secret as well. That hurt. 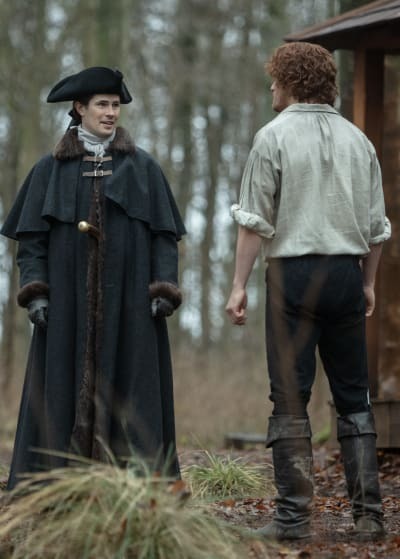 Jamie had just caught up with Murtagh, of course, and hadn't had time to share all of the news of their lives of late, but as the good friends they are, he could have pulled him aside and excitedly shared the news once the duo arrived to spare Murtagh any embarrassment. The lad was not what anyone would expect from the son of Jamie Fraser, that's for sure, but from the moment he laid eyes on Jamie again, it was obvious he recognized him. It was fortuitous of John to get the measles so Jamie and William had time to tour Fraser's Ridge. Not only did they have time to bond, but it allowed Jamie to get a little manliness into his son. That's not a dig at my man John, either. That's a dig at society in general. This girl didn't find her manliness until she went camping and learned to pee in the woods, catch fish, and all that cool stuff, either. Still, kids will be kids, and sometimes it takes a fall from grace to learn the tough stuff. The smile on William's face when he "found" the fish in the Indian's trap was awful. Jamie couldn't have been lucky that his neighbors would be asleep that late into the morning, and he wasn't. Meaning to take blood for the theft against them, the Cherokee grabbed William. 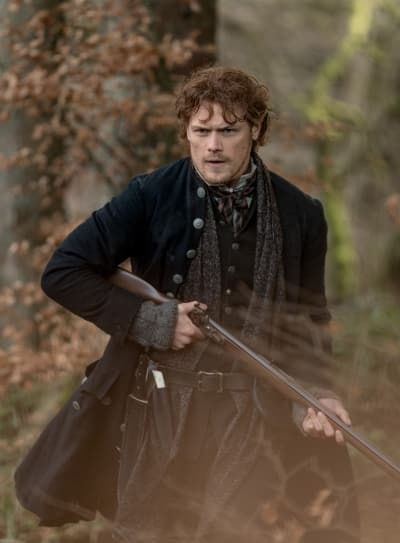 Whether William believed Jamie in that moment or not doesn't matter because he learned something from the time he toured with Jamie on Fraser's Ridge. Or he learned it from his Papa. Maybe it was a combination of the best of both men. William: No! No. He's not my father. He's not my father! He showed me the boundaries, but I did not respect them. I alone stole your fish. Maybe the point is that even if you don't get what you want, you get what you need. The good ol' Rolling Stones. Ideally, Jamie should have been raising his children. He deserved that. But in entrusting their care to two men who didn't begin with the best of intentions toward him, they both did quite well by him when it came to his kids. Brianna is a spitfire like her mom, intelligent like her dad, and with a warm heart like her father. William has all the courage his father ever had, and Jamie got to see it first hand as the boy spared his life. 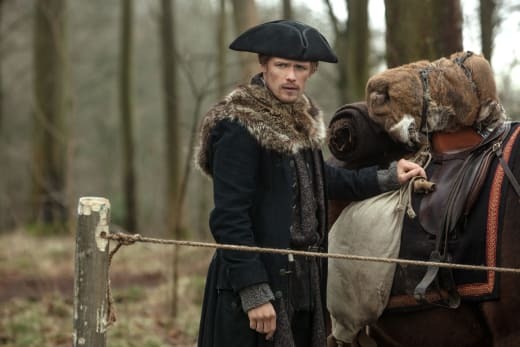 Jamie didn't want to give little Willie any hope they'd see each other in the future, but a more mature William didn't have that same problem six years later. It was probably the best gift he could have given Jamie before they left. The final scene with the ring was hands down the most romantic and beautiful the season has had to date. Lord knows, they had waited long enough to share some time together, and I appreciated that we weren't subjected to a quickie in the woods under the guise that the two can't keep their hands off of each other. Claire: It's inscribed. "Da mi basia mille." Claire: And I'll give you a thousand more. Permalink: And I'll give you a thousand more. While that may be true, that they waited for a more appropriate and tender time to share with us what can and is still between the couple after all the years since they first met was well worth the wait. Even better was that Jamie didn't rise to the occasion when Claire noted she was the only unclothed one in the room, and he reminded her there is a time when the husband gets to treat his wife to something special. What did you think? Do you feel for Jamie that he spent virtually no time with his children as they have grown and that his impact on their lives is so slight? Can you believe that a man of his general demeanor didn't get to pass on his virtues to children of his own? What would you have changed during the hour if anything? Are you a fan of Lord Grey? How did the grown Master William impress upon you? Let's get into a conversation! Don't forget that you can watch Outlander online anytime to catch up on all the love and romance! Lord John: Have you not fared well in the new world? Murtagh: Aye. I've more than rats to eat, my Lord. William: You've eaten rats, sir?! Permalink: You've eaten rats, sir? !